So what exactly is that title all about? Aren’t DAGs a good thing? Why would I ever want to decommission them? Well, yes. You are correct. They are a good thing. And I always recommend putting them in place. 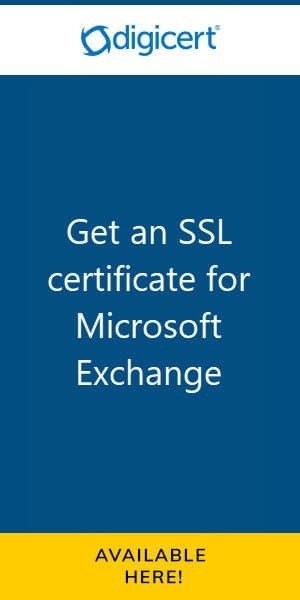 This article is for the organization that has migrated to Exchange 2013. It assumes you have successfully moved all user, shared & resource mailboxes. That you have migrated and removed all Public Folder content. That you are ready to delete your 2010 DAG. Before we can delete a database we need to check that no objects are homed to 2010 anymore. The easiest way to do this is PowerShell. First, let’s check no archive mailboxes were left behind. To check a specific database issue the following command. If any exist you can move them with the following command. C:\> Get-Mailbox -Database "Ex2010_db" -Archive | New-MoveRequest -TargetDatabase "Ex2013_db"
Repeat this process for Arbitration mailboxes as well. 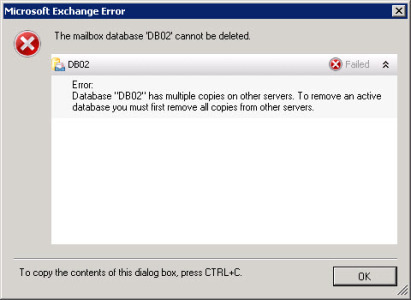 C:\> Get-Mailbox -Database "Ex2010_db" -Arbitration | New-MoveRequest -TargetDatabase "Ex2013_db"
Repeat this process for the Discovery Search Mailbox. C:\> Get-Mailbox DiscoverySearch* | New-MoveRequest -TargetDatabase "Ex2013_db"
To monitor the move progress use the Get-MoveRequest cmdlet. It will output a table of all requests and their current status. Now that you have confirmed you have no objects pointing to 2010 you can remove them. However, if you try to remove the database you may receive the following error. Error: Database <name of database> has multiple copies on other servers. To remove an active database you must first remove all copies from other servers. 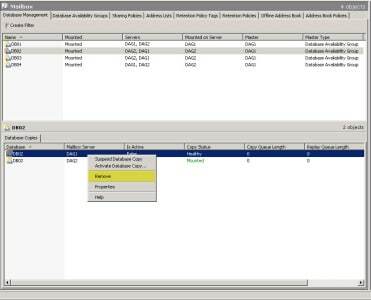 Open Exchange Management Console (EMC). In the middle pane, under the Database Management tab, select a database. The active and passive copies will be displayed in the section directly underneath, titled Database Copies tab. The passive copies will normally show as Healthy under the Copy Status column. Right-click on each passive copy and select Remove from the context menu. Click Yes to confirm. Note: Active copies will display as Mounted. You won’t have an option to remove these. As you remove each passive copy it will be reflected under the Servers column. In our example, you can see that DB01, DB03, and DB04 only exist on one DAG member. DB02 still exists on both servers. Once your Servers column lists only one entry for each database, right click on the database and select Remove from the context menu. Click the Yes button to confirm. Repeat for all other databases. 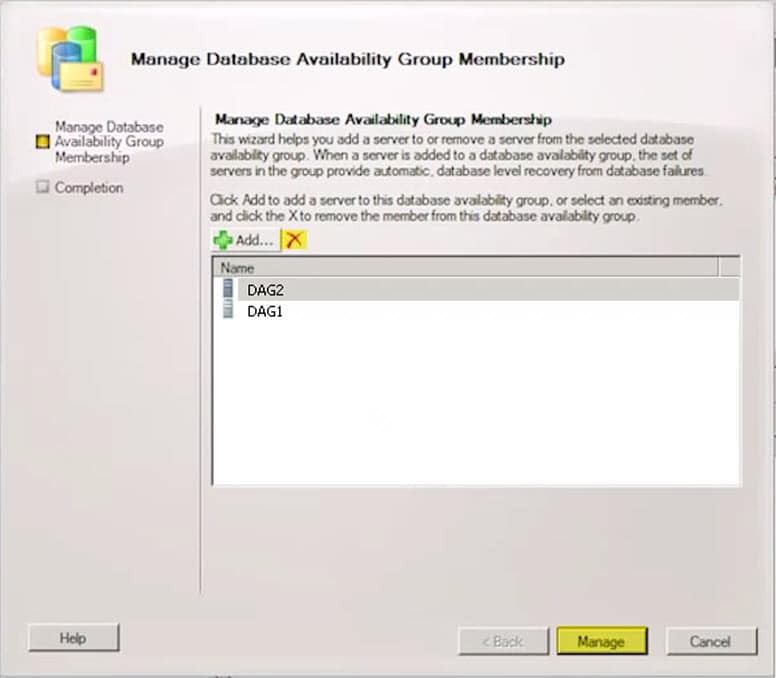 Select the Database Availability Group tab. 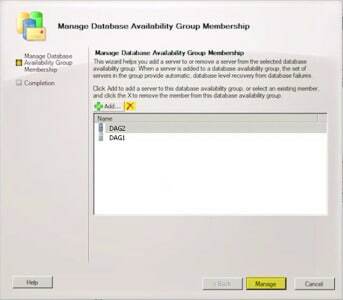 Right click on the Database Availability Group (DAG) and select Manage Database Availability Group Membership from the context menu. Select each DAG member and click the red X button. Now that the DAG members have been removed, we can remove the DAG itself. 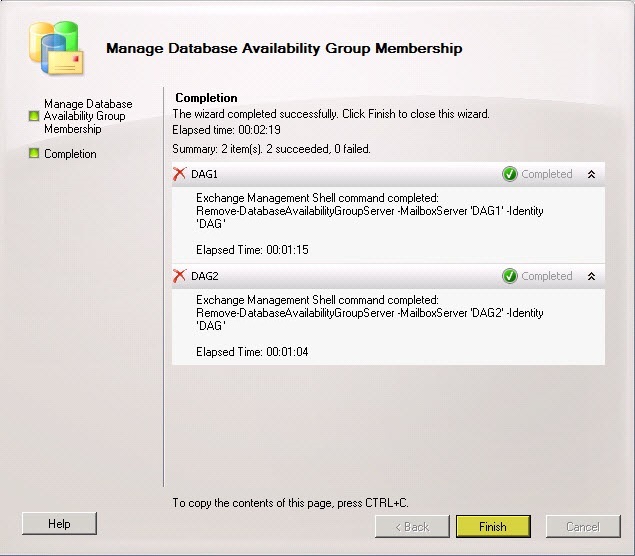 Right click on the Database Availability Group (DAG) and select Remove from the context menu. Your DAG (and all its databases) have now been removed. You are well on your way to decommissioning Exchange 2010 from your environment. Keep your eyes peeled for other great articles on this blog! What about the deleting the Witness Share and folder, and the DAGs computer Object from AD? Anything special that needs to be considered, or can I just remove the witness share, remove the shared witness folder, and delete the DAG’s computer object? Good point Jane. I will get these items added to the article. But in response, yep, you can remove the file share for the File Share Witness and delete the content it creates from Windows Explorer. Then you can also remove the Exchange Trusted Subsystem group from the local administrator group on the server hosting the FSW. You can then delete the cluster name object which is represented by a computer account.